Find hotel near Ancient Temples Of Kalach ..
Just like the name gives away, the Ancient Temples of Kalachuri were built hundreds of years ago by the Kalachuri Maharaja – Karnadeva. The exact dates of construction are said to be around 1042 – 1072 A.D. 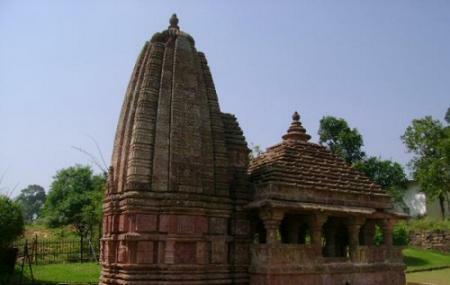 There are a number of temples in this complex, with the Pataleshwar Mahadev Temple and the Machhendranath Temple being the most important ones. Extensive restoration work done on the sites have improved the conditions of these grand temples and made them very popular amongst visitors from all over India and event the world. Please ask locally for visiting times of Ancient Temples of Kalachuri. How popular is Ancient Temples Of Kalachuri? People normally club together Dudh Dhara and Narmada Kund while planning their visit to Ancient Temples Of Kalachuri. Ambience: ⭐⭐⭐⭐ The place is well-maintained, and certainly a great place to visit with family. Camera 📷 is not allowed 🚫 inside. One can pick a corner of this large place to meditate, hopefully saved from the nuisances of tourists. Parking 🏍️: ⭐⭐⭐ Congested open-air roadside. Comfortable enough for four wheelers. I just loved the place.. Amarkantak is a marvelous place to visit i prefer that everyone should visit and see natural beauty i suggest you to go on winters.. and most important don't miss the Sun rise point. Very good place ,their are very ancient monuments in this place . This is ancient place with a number of temples from where Narmada river originates. The place is located at top hills and surrounded by green plantations and water falls. One can enjoy the nature as a tourist as well as travel for pilgrimage.